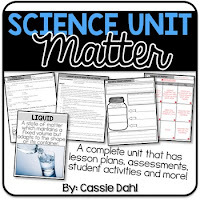 One of my favorite science units to teach is Matter. My fourth graders come in knowing the basics about solids, liquids and gases. But, I get to "blow their minds" with some fun science experiments. I start the unit off with this super easy experiment to prove that gases really do have mass. To start, you will need some materials that you probably already have in your classroom. Start by preparing a few of your cups ahead of time (it takes a few minutes). Leave at least one to show your students that you are not "fooling them". To prepare the cups- fold a napkin into quarters and then use a piece of tape to secure it to the inside bottom of the cup. 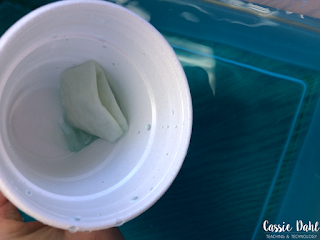 Fill your container with water so that the cup will be completely submerged when placed in the container. 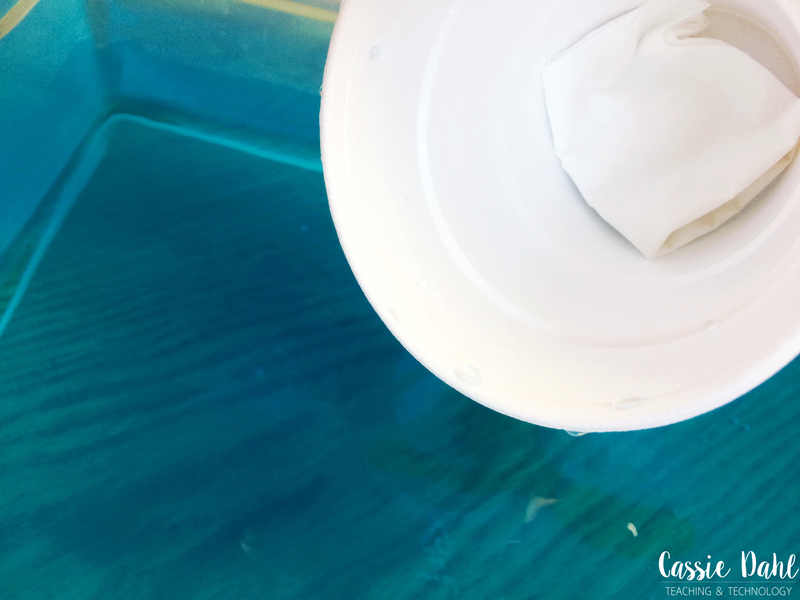 I add blue food coloring so it is easier to tell that the napkin gets wet but you can use any color you would like (and if you don't have any... that is okay too). Once you are ready, gather your students around. 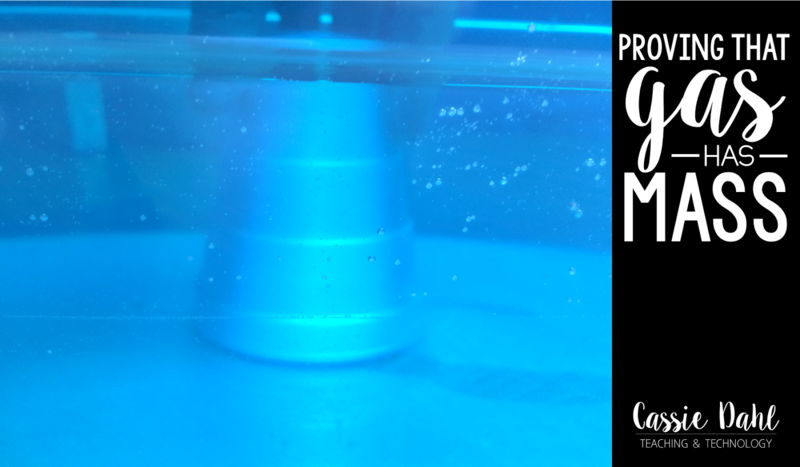 Walk through making one of the cups to prove that their are no secret tricks. 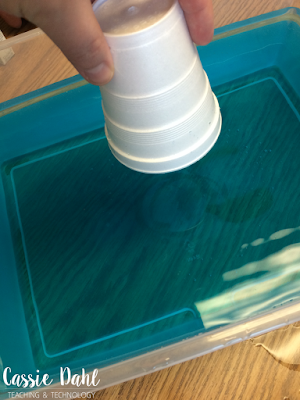 If you have science notebooks, have them make a few predictions about what they think will happen when the cup gets placed into the tub of water. Now you are ready to get a little wet! 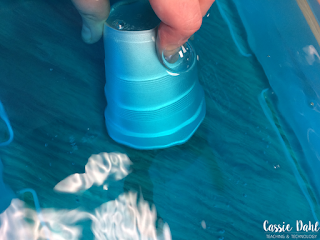 Start by placing the cup level with the surface of the water (bottom up, drinking side down). Make sure that the cup is level with the water. 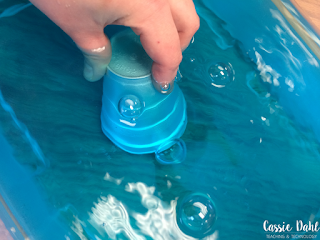 Then slowly, start to push the cup straight down to the bottom of the tub until it touches! Your kids are going to probably be telling you that the napkin is going to be soaked and that you are crazy for "turning your hand blue". Make sure the cup stays level the whole way down. Keeping the cup level, pull it straight back out of the water. Show your students the inside of the cup. The napkin is dry! Total craziness right?! You can put it back down in the water as many times as you need to. Prove to your students that you are not pulling their leg. Have them offer up suggestions as to how the napkin stayed dry. 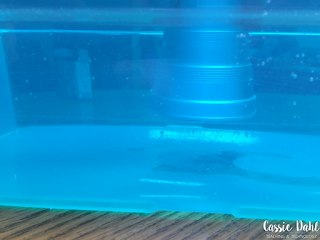 This experiment is proving that gas has mass. 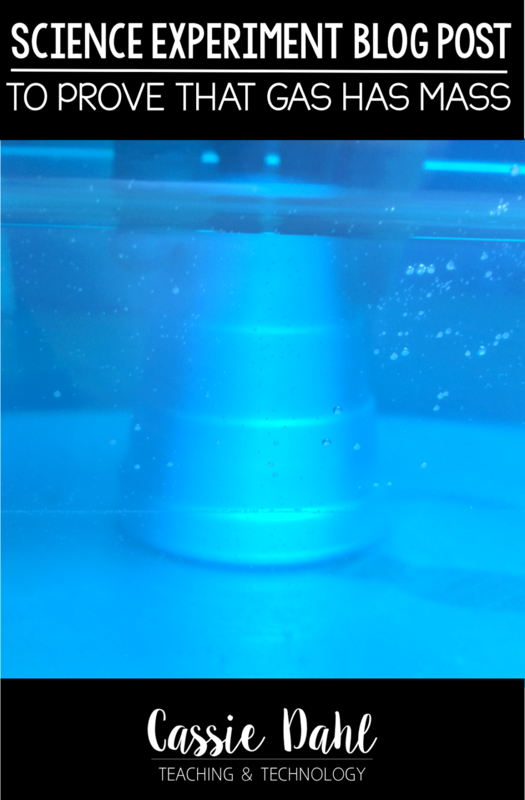 The gas (oxygen and carbon dioxide) that was in the cup to begin with when you started pushing the cup down in the water, had no where to go- no way to escape the inside of the cup. 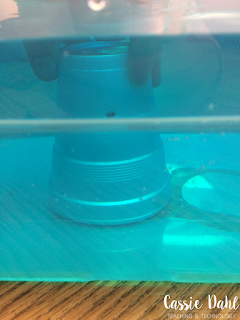 This "bubble" of gas inside the cup made a barrier so water could not enter the cup. The napkin was protected by this barrier. 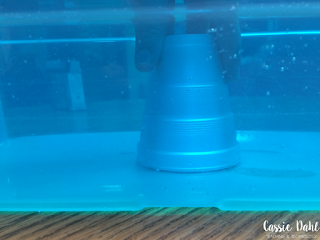 Now, you can ask your students what would happen if you put the cup to the bottom of the container and turned the cup just a little bit to let some of the air escape and reach the surface. Then do it! This is where it is nice to have the extra cups on hand! 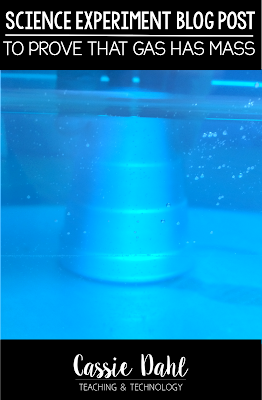 Let the cup sit at an angle for a little while and wait for all of the gas to escape to the surface of the water (perfect time to do a quick lesson about density). Once you are pretty certain the gas has all escaped, ask your students what they think the napkin will be now (wet or dry). Remove the cup from the water. Ta-da, wet napkin. Have a conversation with your students about why the napkin is wet. 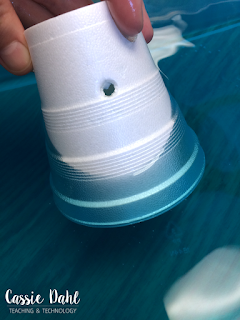 To add a little more pizzazz to your amazing science experiment, poke a hole about a half inch-inch down from the bottom of the cup. 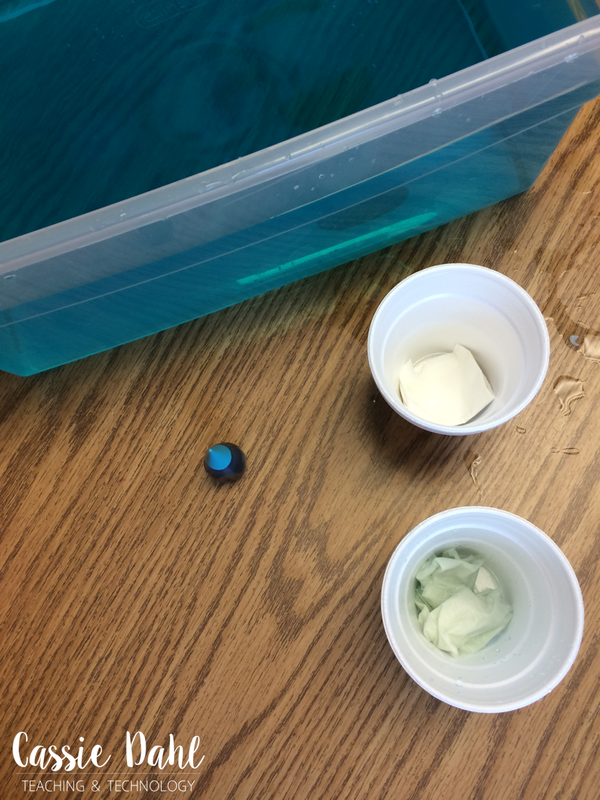 Again, your students can make predictions about what they think will happen when you put the cup straight down into the tub of water. Then go ahead and put the cup in the water! You guessed it, all the gas will come bubbling out of the hole and the napkin will get wet. 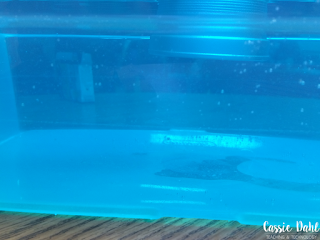 Have your students write what they learned and how this experiment proves that gas really does have mass. 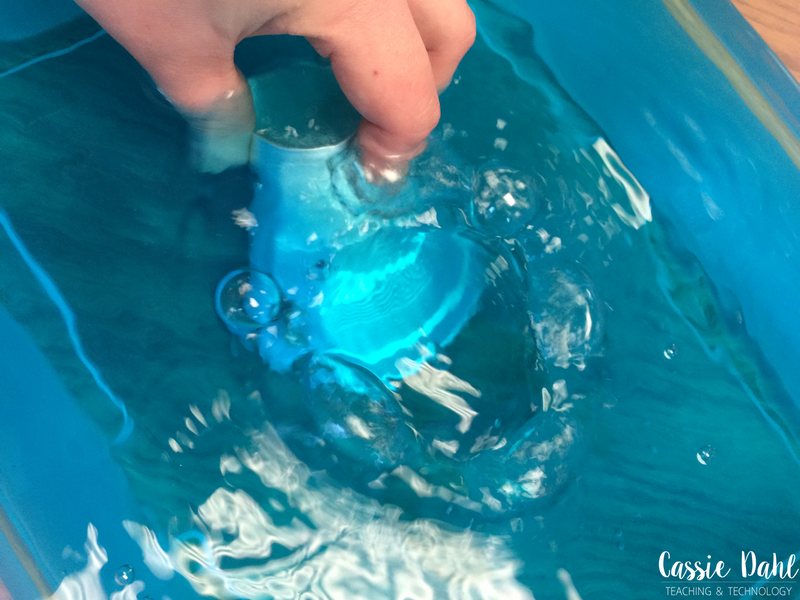 Is this an experiment you can see yourself trying out in your classroom? Do you have a favorite go-to experiment? My students love them and they learn so much more by actually seeing a concept in action than they do reading it out of a book. You can pin the image below to save this blog post for later and to share it with your friends. Looking for more materials to teach about Matter or more Science Experiments? Click either image below to go check out the products that I use from my TpT Store. 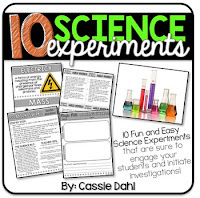 This science experiment is included in my 10 Science Experiments, so if you are looking for a recording sheet or vocabulary cards for the experiment, check it out.